Wildwoodz Bushcraft - will you survive? Go Wild in our Woodz! Are you a survivor? Could you live off the land if you had to? Let's see how much you know by the end of one of our bushcraft courses. Experience the delight that comes with succesfully learning the ancient skills that are becoming fashionable again fast. Ray Mears and Bear Grylls have got nothing on you! Bushcraft is not only really great fun but it is also a collection of knowledge that could just save your skin some day. Did you know you could eat that? Did you realise you shouldn't sleep there? Could you make one of those? 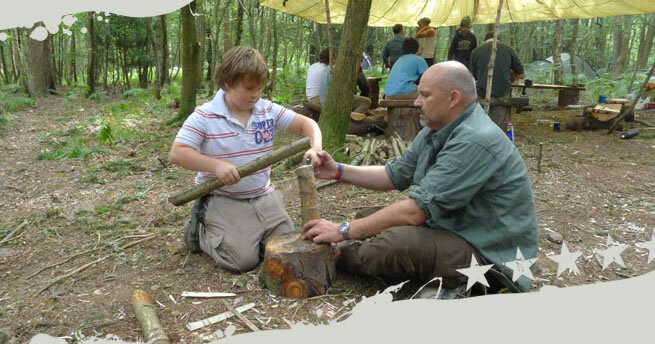 A Wildwoodz bushcraft session to suit your group is right on your doorstep. Our qualified instructors can walk you through everything from forest foraging and firelighting to full on Zombie Survival Skills if that's what you want to know. Somethings you will use regularly once you know them and others we hope you'll never need....but let's face it - it's cool to know that you can right? Bushcraft Sessions are generally run between two time-slots either morning or afternoon but every effort will be made to accommodate your requirements if we can. Subject to availability. BUSHWACKER BIRTHDAY PARTY - Up to 12 kids aged 8-12 (at least 2 parents must be present please). A roving adventure over 3 hours through the darkest forest at Wildwoodz pausing along the way to examine tracks, wild food forage, build shelters and play games. A visit to the 'Camp' to toast marshmallows or bake bread on a stick over the fire before pinata or cake to finish. A great alternative party activity for kids of all abilities. SURVIVAL SKILLS - Up to 12 persons aged 12+. A 3 hour taster session of the skills you need to stay alive. A forest forage on the way to 'Camp' will then lead into the firelighting competition and the race to brew up and build your shelter. A woodland workshop including tracking and nature crafts finishes the session. 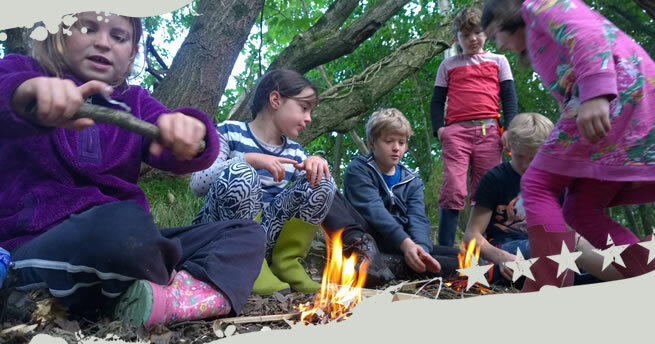 WILD WOODSMAN - Up to 12 persons aged 12+. Now it's getting serious. 5 hours of Woodland know how. Start with your trek to camp which includes a tracking and foraging session learning to light a fire and build a shelter. Once in camp you can specialise your skillset and choose either advanced firelighting, Knifeskills and carving, or tracking and trapping. Hot drinks and snacks are provided - depending on how fast you learn. WWZ ZOMBIE SURVIVAL - Up to 15 persons aged 16+. Not for the faint hearted this 4 hr session will feel real from the moment you leave civilisation behind. Get your survival instruction in real time situations designed to emulate your favourite Films and TV programmes. Total Zombie Immersion created to make you think.... if i decided to go off the beaten track who would i take with me......or who would i leave behind? Longer sessions and overnighters available. Call us for a quote. Please note: Bushcraft sessions take place outdoors in all weathers except very high winds or lightning. In terms of suitable clothing prepare for the worst and hope to be pleasantly surprised. Suggested add on Activity - It has to be either Archery or Axe throwing.